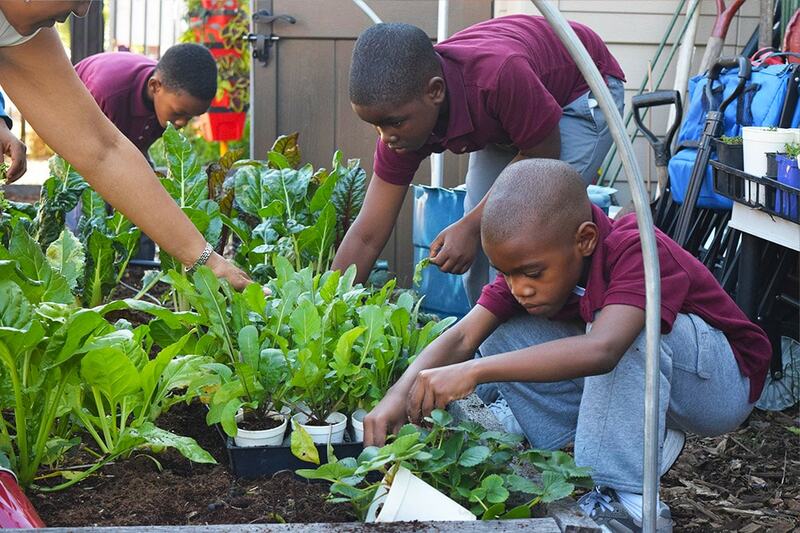 We help schools across the city utilize their green space and activate successful gardening programs. Learn more about how your school can get involved in the urban farming revolution! There are several ways to get involved. If you would like to learn more or sign up your school, please email info@cultivatethecity.com. Work with at least 6 classes to incorporate weekly garden classes into their schedule. CTC leads these classes and focuses on the next generation science standards and STEM. Partner with the school to host special events such as Strawberry & Salads Greens week where students are exposed to local, fresh strawberries and different greens. Host weekly markets where we sell produce from the garden, and our other locations throughout the city. A portion of the proceeds goes back into the school garden. Conduct a Community Supported Agriculture Program which coincides with our markets. Includes general maintenance including weeding, harvesting and more. If you would like to be considered an CTC affiliate school, please fill out a form and tell us more about your school! 2. Field Trip: Plan a trip to one our farm locations where students can participate in an interactive lesson about vertical farming and eating in season. $150.00 for 15 students. $15 per extra student. 3. Class on Site: Students enjoy an immersive lesson hosted by CTC on different wildlife found in the garden or preparing a meal in season. 3. Site Visit: Utilize CTC expertise to expand your schools' green space. We come to your school and create a plan to utilize your green space and activate a garden program with specialized class curriculum. Includes price quote to install VEG towers, Zip Grows or Tower Gardens. $200.00 consultation; $75.00 credit towards materials from CTC. 4. Professional Development: CTC will provide training to enhance your staff and facilities utilization of the garden space. Professional Development includes: growing vertically and hydroponically, social emotional learning, and curriculum implementation. We encourage all staff to participate. Two, 2 hour training, minimum 3 staff members. Contact regarding pricing. Impacting more than 2,000 in DC Since 2015! We'll send you events, updates about our school programs, and news about our gardens.